I am in the lull between the end of classes and the beginning of grading finals, so I thought it might be a good time to work on the garden. I've been wanting to try my hand at roses this year, ever since noticing some spectacular plants in some of the older neighborhoods I ride my bikes through. They look fabulous, even when everything else is succumbing to the drought and our unusually harsh winter temperatures. So I thought I'd ride on down to my local nursery and see what they were offering. When I got home from work today, however, I was feeling kind of blue and unmotivated to ride, in part because the wind is blowing gangbusters for what seems like the umpteenth day in a row. So I sat around the house for about half an hour, feeling sorry for myself and generally crabby, before I finally dragged Annette out of the shop and into the sun. It's a funny thing about Annette. She doesn't seem to mind a blustery day. She is heavy and slow, and rides like a stately cruise ship. When I turn her into the wind, there is scarcely a ripple of acknowledgement from her that conditions might be harsh. She simply rides on--stoic, steady, serene. 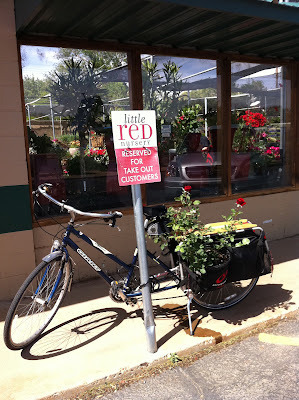 By the time I got to the nursery, I was feeling a wee bit better, but still crabby. 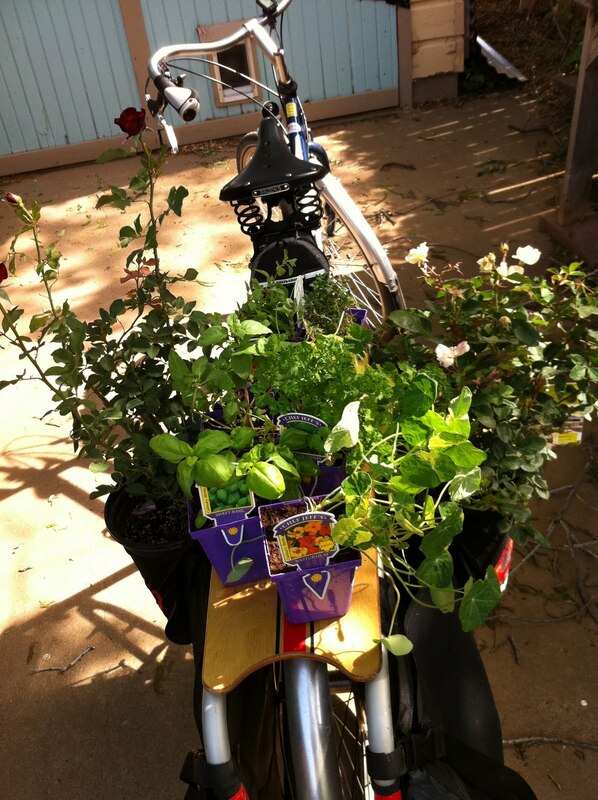 I picked out my roses, and some herbs, too, and loaded up her large saddle bags. I took off down the street, and then oh, my goodness gracious, the wind swirled and whipped around me and I was bathed in the smell of roses. I stopped off at Holly Hop Ice Cream Shoppe for an iced tea to go, and then tuned my iPhone to KPLU, "where the temperature is always cool," and rolled on, smelling of roses and listening to west coast jazz in that old-fashioned, tinny, summery sound that only radios in the open air can make. what a beautiful moment, steadily cruising on annette, enveloped by the smell of freshly rescued roses. were you heading into the sunset...?! Excellent job by Annette & the Rider-in-Chief!